"They Say / I Say" shows that writing well means mastering some key rhetorical moves, the most important of which involves summarizing what others have said ("they say") to set up oneâ€™s own argument ("I say"). In addition to explaining the basic moves, this book provides writing templates that show students explicitly how to make these moves in their own writing. Gerald Graff is a professor of English and education at the University of Illinois at Chicago. He is the author of several books including Professing Literature: An Institutional History, Beyond the Culture Wars: How Teaching the Conflicts Can Revitalize American Education, and Clueless in Academe: How Schooling Obscures the Life of the Mind. Cathy Birkenstein is a lecturer in English at the University of Illinois at Chicago. 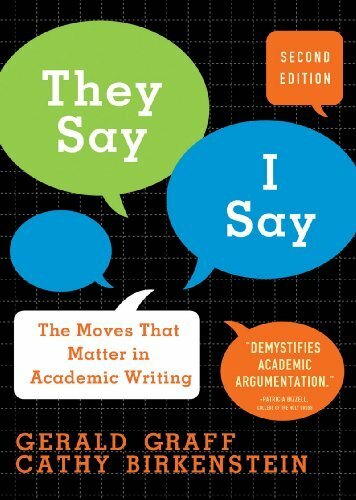 She is the author along with Gerald Graff of They Say / I Say: The Moves That Matter in Academic Writing.